Dealing with junk can range anywhere between simple annoyance to a real problem. Often it’s not just a matter of will and time but also of capability. And while getting rid of the junk in your basement doable on your own dealing with construction rubbish can be quite problematic. However even in the cases when you can technically do the job yourself it usually involves investing time, money, a lot of energy and often comes with the price or injuries – anything from muscle strain to sometimes regretfully severe injuries. It’s in the nature of rubbish that it varies and so varies the most appropriate way of disposing of it. Fortunately an easy alternative solution is hiring a company that offers rubbish removals in London and not have to deal with the complexity of a large junk collection in London. A company like ours that specializes in certain type of services can offer customers solutions that are not necessarily accessible to them. In a hectic city like London rubbish collection can be quite problematic so a more reliable solution can be provided by a trained professional. 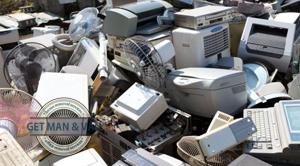 Our company can offer to send you a highly skilled removal specialist to collect any junk. We service both private and commercial customers and are prepared to offer you fast and safe rubbish collection in London no matter if it’s you wanting to clear out your attic or have a pile of junk due to your business. The entire waste collection & disposal process will be handled by us, which means you won’t have to strain yourself with lugging heavy things across the property, or anything else for that matter, as our waste disposal crews will take care of the entire job from start to end. This also includes carrying the discarded items outside, and loading them onto our vehicles. If you’re interested in using our either our London man and van or rubbish removal services you can read our terms and prices on our website as well as all the services we provide. Our lines are open for customers to contact us and all our operators are prepared to consult you on our services. There is a large amount of flexibility to our services so feel free to ask for a personalized quote. Our rates are subject to change depending on the type and size of the collection project and prices can decrease depending on the details. Needless to say, our rubbish collection and house clearance London covering service is going to help you better prepare for an upcoming house removal. By ridding you of the junk that clutters your property, our men will enable you to finish the packing and preparation for the move quicker and with less resources, thus reducing the stress and strain of the whole endeavor considerably. It is a wise thing to do, trust us. Our waste collection service is perfectly suitable for disposal of leftover building materials, after re-modelling or renovation, the waste disposal service is also quite handy for when you need to clear out your garage, attic or basement, or simply get rid of old furniture or office equipment which you no longer need. We also offer customers the option to have commercial waste collected and disposed of from their establishment or business property quickly, effectively and affordable. There will be no roaring diesel trucks craning heavy skips around your commercial estate, as our diligent and well organised waste disposal teams will quickly pick up and load the junk in manageable portions. London is famed with many things, including the wealth of open green spaces that are located within the premises of its huge metropolitan area. The city is home to Hyde Park, Kensington Gardens, Kew Gardens, St James’s Park and many others. Additionally, the whole city is surrounded by the so called Metropolitan Greenbelt, a hub of commons, open fields and forests that are under special protection by the law and are unique for the capitals of the world.